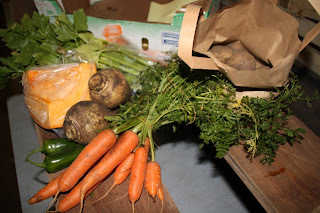 This week's small £6 veg boxes contained a bunch of carrots, a kilo of valor potatoes, some small swedes, a head of celery, 2 jalapeno peppers, a bag of kale, and a portion of pumpkin. The standard £10 veg boxes contained 2kg of valor potatoes, a portion of pumpkin, a bag of kale, some flat-leaved parsley, a bunch of carrots, mixed salad leaves, the last tomatillos of the year, 2 jalapeno peppers, and some bulb fennel. On Saturday 21st November the farm played host to 14 cub scouts from the local area. First of all we all mucked in together to pull out and compost our past-it French bean plants in the polytunnel. 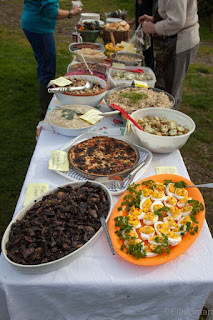 Then we had a tour of the farm and harvested lots of different vegetables and herbs for lunch, and met the chickens. 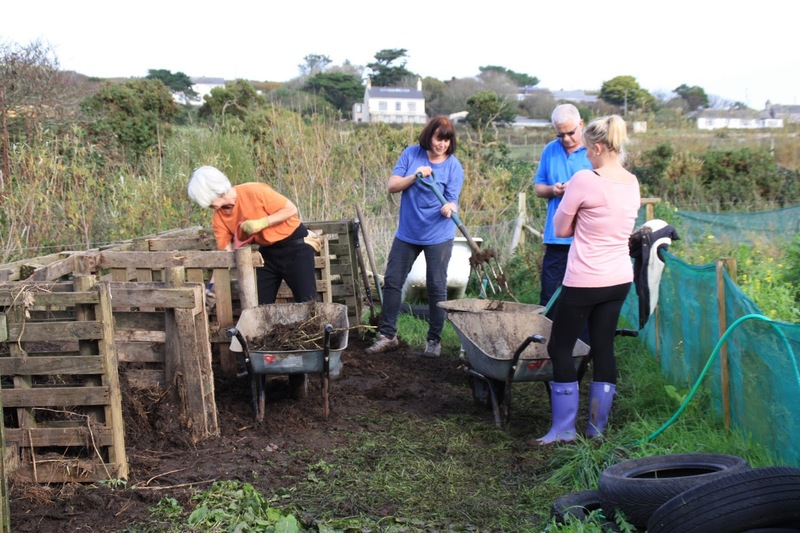 And finally the cubs and their leaders built a fire in the farmyard, where they cooked and ate vegetable soup using the farm's produce. 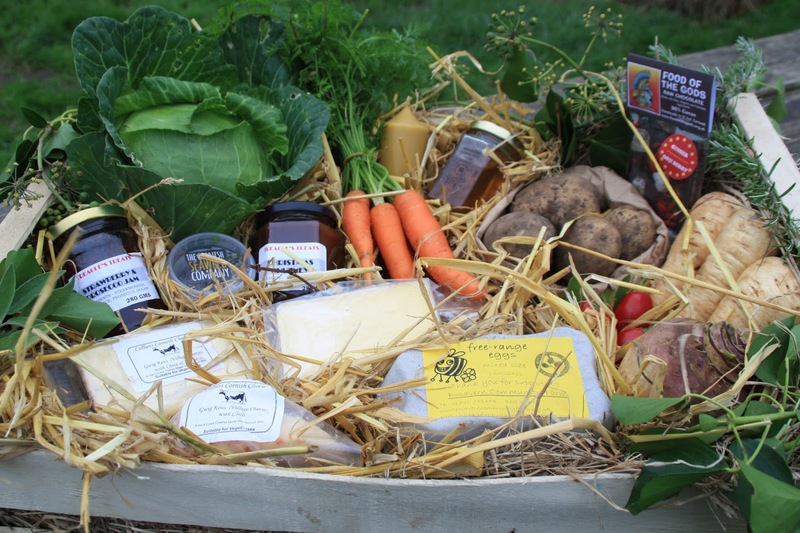 Hampers will be ready for collection on the 22nd and 23rd of December - please contact the farm to order yours. Tomorrow is "Black Friday", one of the main days of the consumerist calendar. 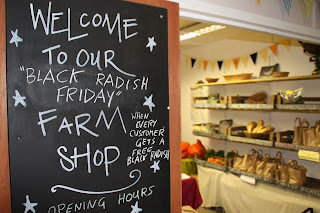 To help celebrate this, we are holding "Black Radish Friday" in our farm shop, where every customer throughout the day gets a free black Spanish radish. 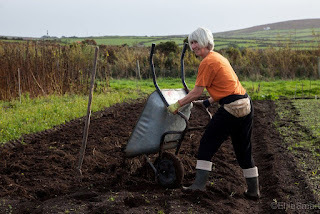 These are bigger and spicier than other radishes, and are amazing grated into coleslaw. 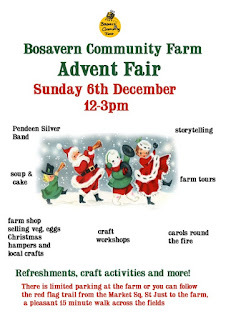 So come and do your shopping with us tomorrow and try one out for yourself! Solar panel and farm entrance application. 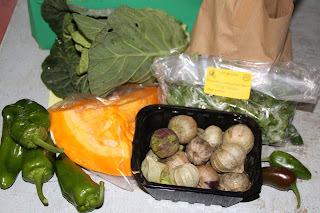 Small £6 veg box - mixed salad leaves, Valor potatoes, parsnips, black Spanish radishes, cabbage, and a pumpkin portion. 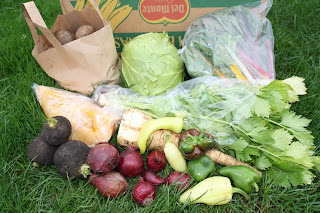 Standard £10 veg box - Valor potatoes, cabbage, rainbow chard, pumpkin portion, celery, black Spanish radishes, red onions, parsnips, and sweet peppers. 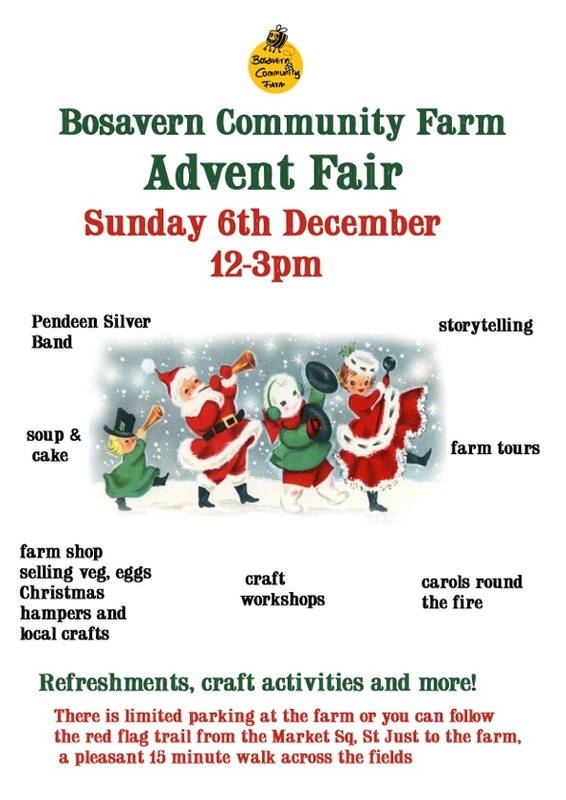 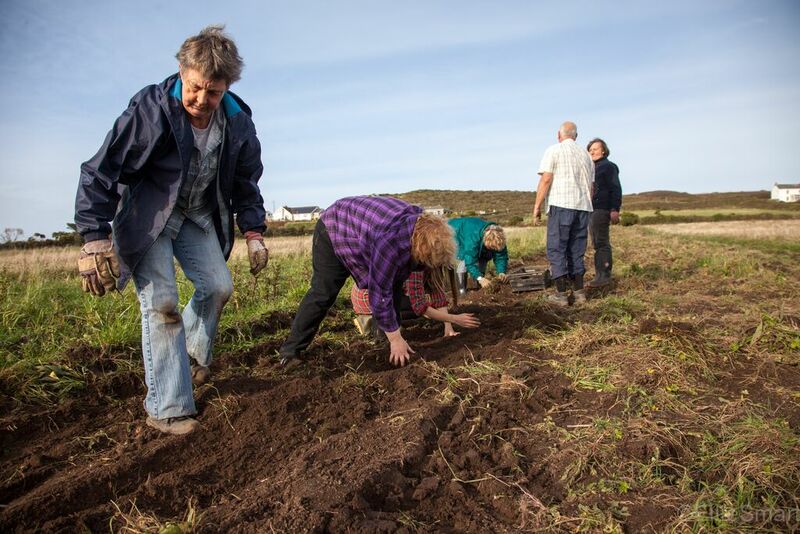 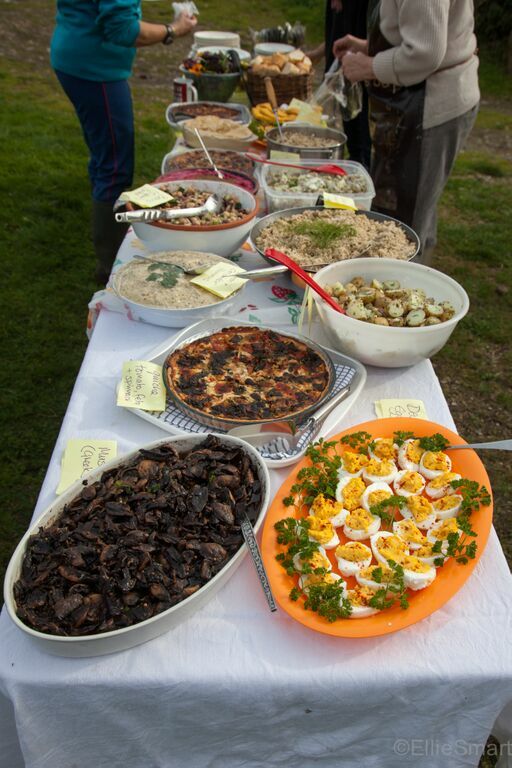 Bosavern Community Farm has recently joined the Community Supported Agriculture Network UK, and we have leaflets available in our shop with information about the organisation. 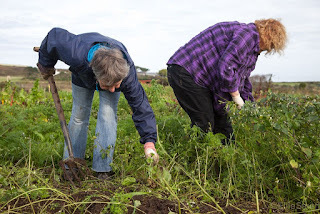 A CSA is a "partnership between farmers and the community where the responsibilities, risks and rewards of farming are shared. This may be by CSA members paying for their veg boxes in advance, investing in the farm, or by helping out with growing and harvesting". 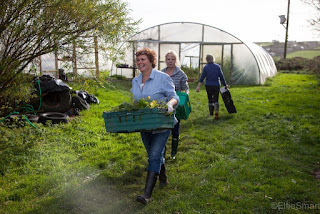 Although our members do not pay for their veg boxes in advance (and neither do they receive a "share" of that week's harvest, but receive veg to the value of their box plus a little extra) some of them have invested in the farm through our Community Share Offer, and/or help as volunteers on the farm regularly or occasionally. Our veg box scheme has now been running since June 2011 and currently has approximately 40 members - please contact us if you would like to join. 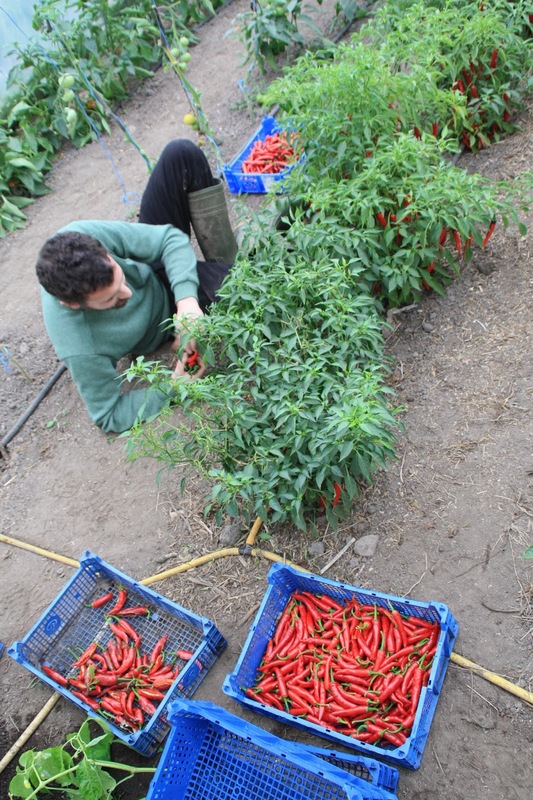 Andre, from Rio de Janeiro in Brazil, spent three weeks volunteering on the farm before heading off on Thursday, and we'd like to thank him for his help, especially on Sundays. 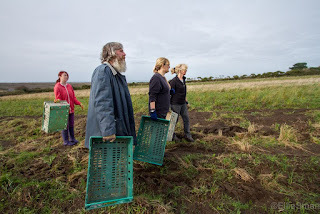 He's in the previous photo rolling up the mipex, on the far left of the group. 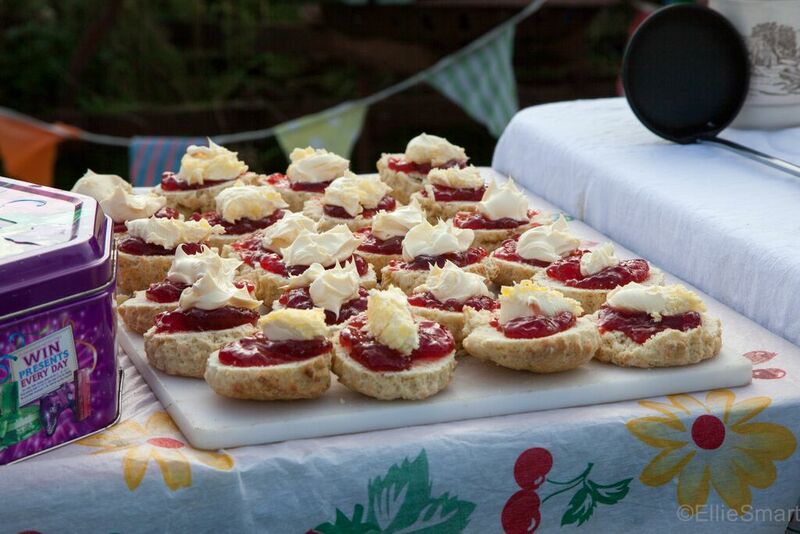 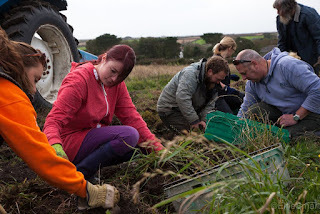 Shortlisted in Cornwall Sustainability Awards 2015. 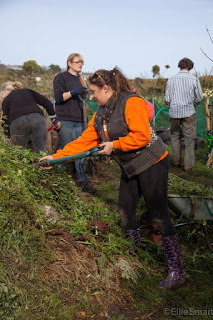 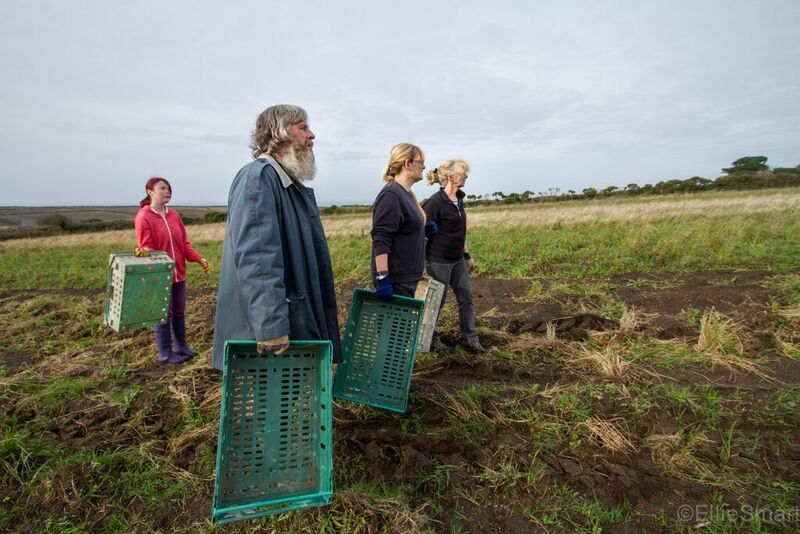 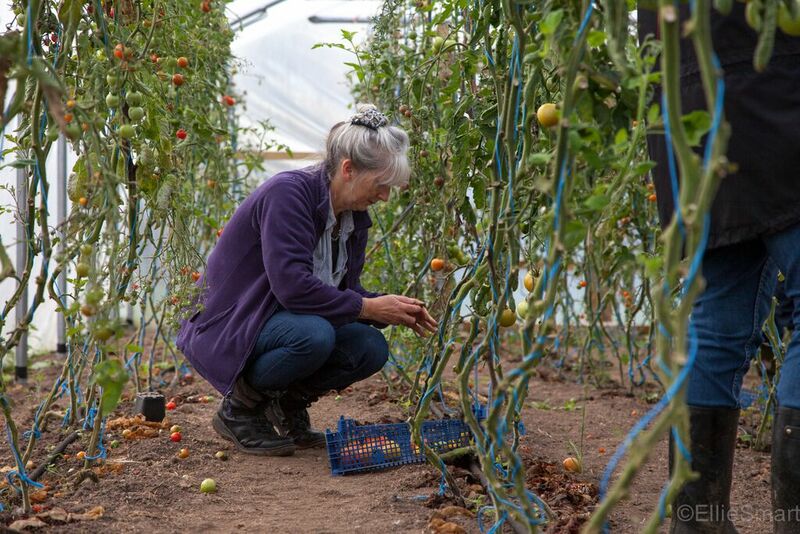 Bosavern Community Farm has been shortlisted in both sections of the Cornwall Sustainability Awards that we entered - "Best contribution to creating a sustainable food economy - from nature to plate" and "Best environmental growth". 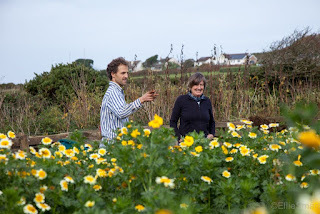 We will find out in December if we have won either of these awards, but just to be shortlisted is a fantastic achievement by everybody involved with the farm. Cecile, from France, moved on to her next wwoofing assignment last Saturday, after two weeks helping on the farm - thank you Cecile and good luck for the future! 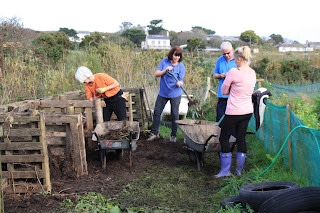 Cecile (on the left in full red waterproofs) helping other volunteers to roll up the mipex from our finished pumpkin patch. 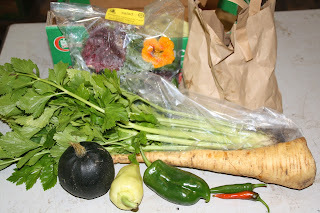 Last Friday's small £6 veg box contained - a cabbage (or cauliflower), a kilo of potatoes, a bag of fresh coriander, some peppers, a portion of pumpkin or squash, 2 jalapeno peppers, and a punnet of tomatillos (a Mexican delicacy, like sour green tomatoes, prized for their tangy salsas). 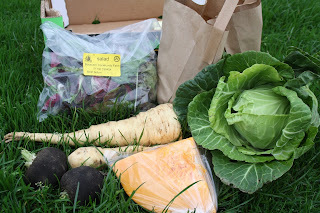 The standard £10 veg box also contained tomatoes, a globe artichoke, a bulb fennel, and some mixed salad leaves. Please contact us if you would like to join our veg box scheme! 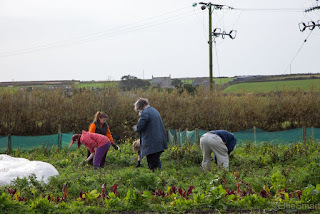 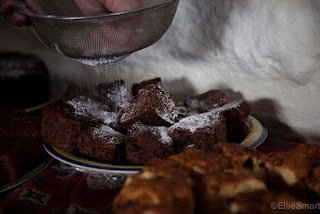 Here are some shots taken by our guest photographer on the day, Ellie Smart. 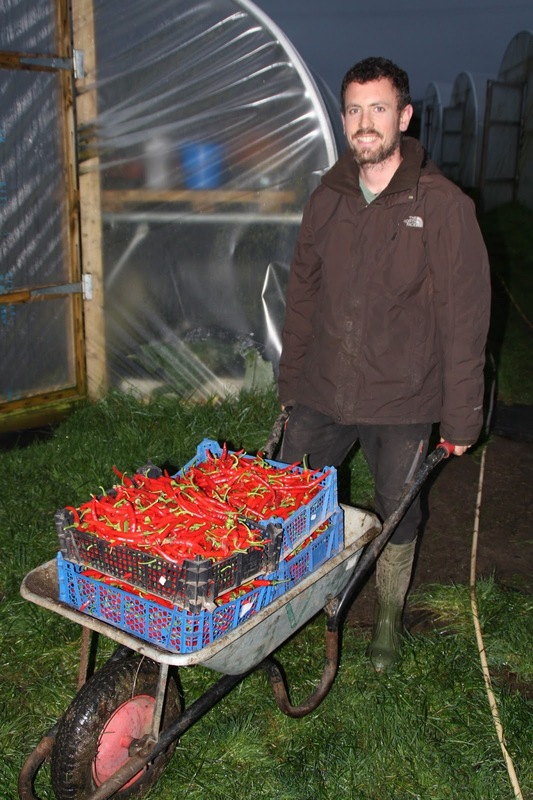 We have just picked all the red "ring of fire" chillies in our polytunnels, and are drying them for storage and selling. 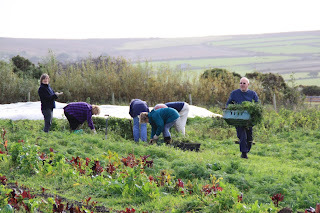 We picked 20kg fresh-weight, a vast quantity, but this weight will reduce once they are dried. We have strung some up on cotton thread, and all are drying in the farmhouse kitchen next to the Rayburn. 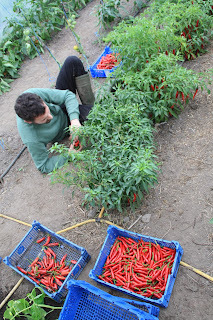 Daniel picking chillies in Valentine. Daniel with a wheelbarrow full of chillies. 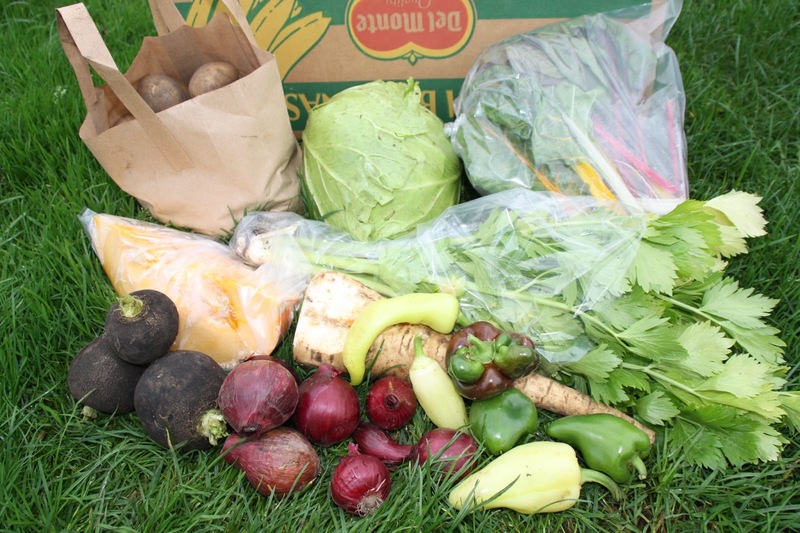 Last Friday's small veg box (£6) - a bag of mixed salad leaves, a kilo of potatoes, a head of celery (good for making stock), a "gem" squash, parsnip, peppers, and green chillies. The standard veg box (£10) also contained fresh coriander, tomatillos (a Mexican delicacy for making spicy salsa), rainbow chard and beetroot. 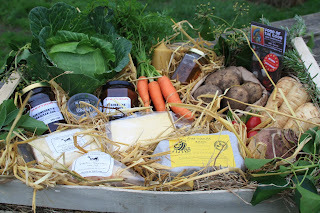 Please contact the farm if you would like to join our veg box scheme, telephone 788454. 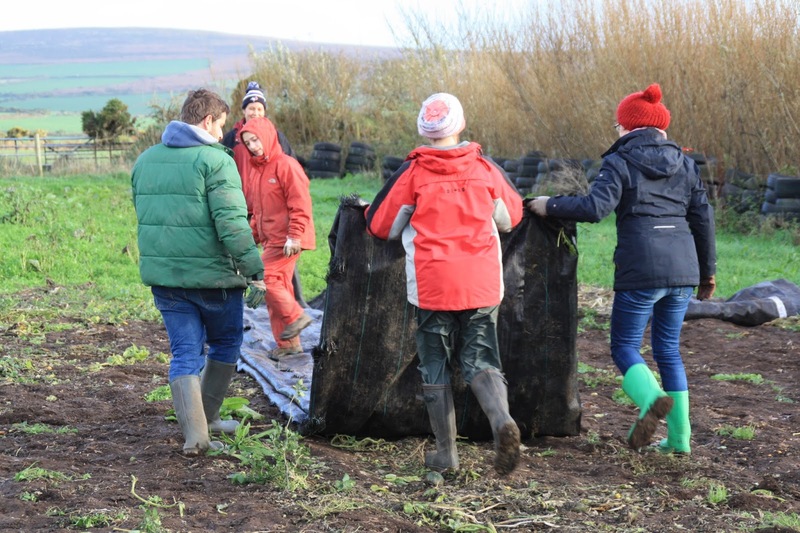 4) Spreading and turning compost with Hugh. 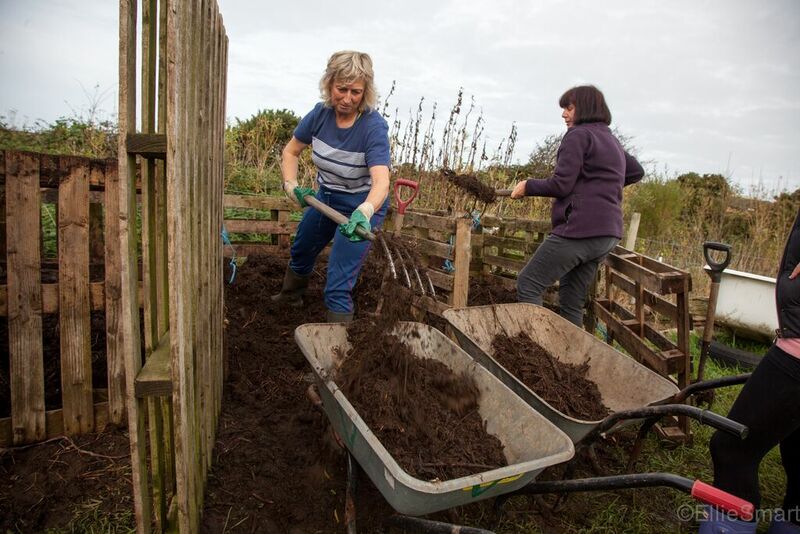 One team wheelbarrowing compost to the broad bean patch. 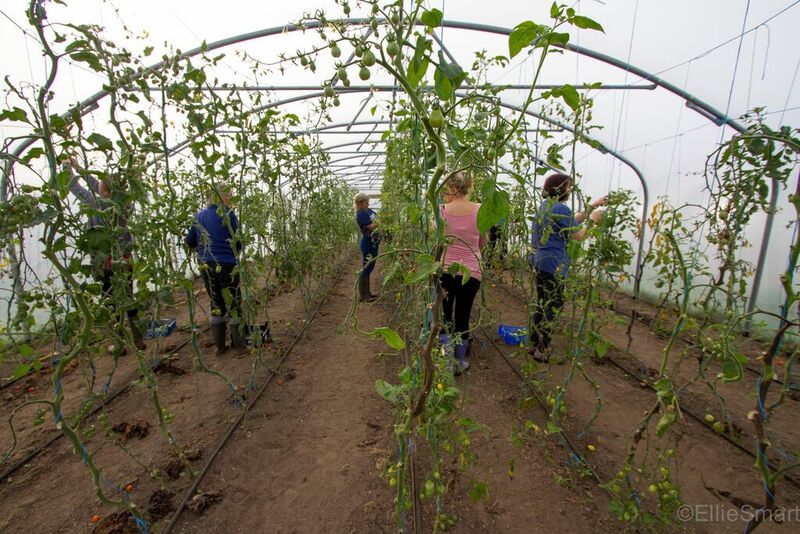 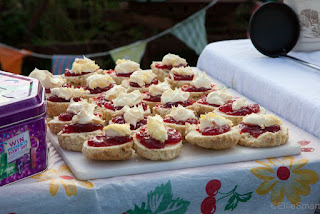 Each team spent one hour on each task, rewarded not just with the enjoyment of hard work, and the positives of team building, but with a superb lunch made mostly from farm produce, and a cream tea with a fun quiz to end the day. 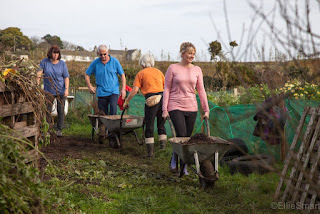 We harvested over 200kg of potatoes, weeded half the carrot patch, harvested all the remaining tomatoes (both ripe and green) and got the plants onto the compost, spread all the ready compost on the market garden, and turned most of the rest. Thank you to all the YMCA people who came on the day and made it such a success - we hope to see you again next year! 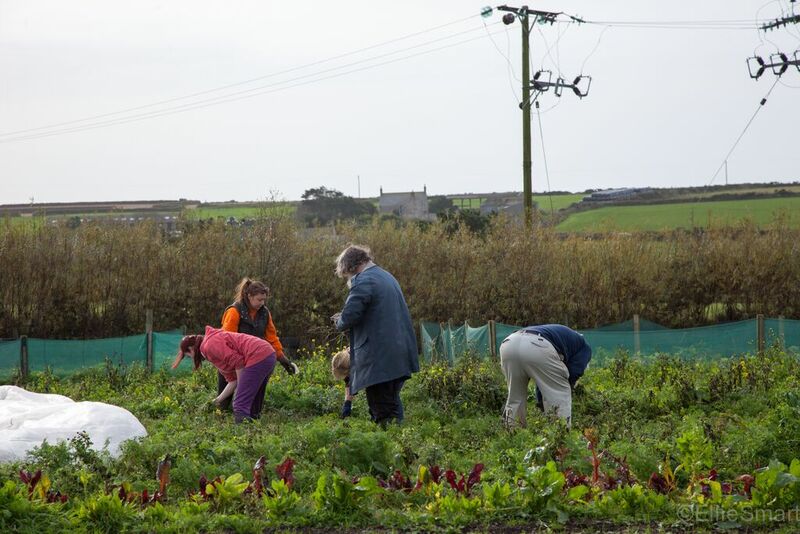 Also big thanks to everyone who helped the farm hold the event - Nikki, Alice, Jenny, Sonia, Willow, Ian, Mark and Yvonne - and to our four wwoofers for picking lots of veg and eggs whilst we were otherwise occupied - Stuart, Paul, Charlotte and Daniel. Stuart (left) with Charlotte and Paul (right) enjoying tea-break in the farmyard. 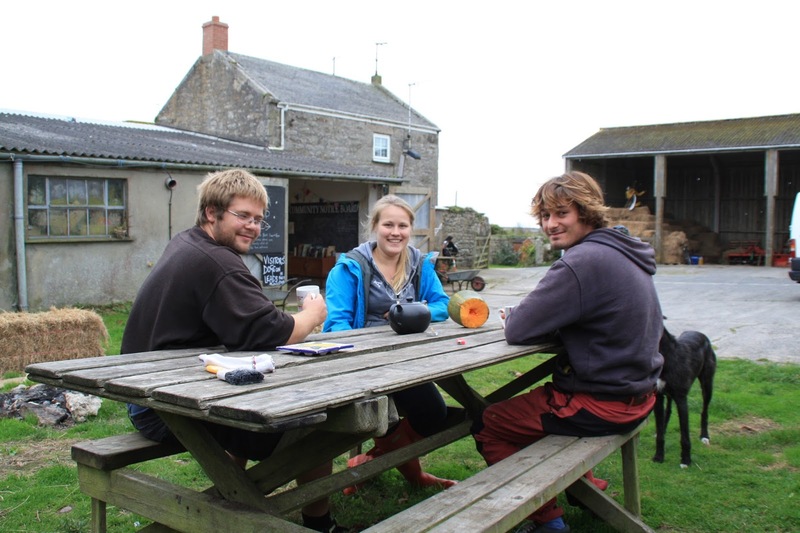 Stuart (from Blackpool), Charlotte (Germany) and Paul (France) have all left the farm in the past few days after extended stays as wwoof volunteers, and we'd like to thank them all for their help and wish them the best for the future.